May 7th Day 1 Election Day! Zeebrugge to Luxembourg 211 miles. With force 7 winds overnight we thought we would have had a rough crossing on the ferry - but the force was with us! - as any sailor will tell you it's better to have wind behind than be against the wind and it was a strong westerly which blew us across the North Sea with minimal discomfort. Arrived to a chilly rainy Zeebrugge and a rather grim drive through the industrial outskirts in pouring rain, but within a couple of hours the sun was shining ( at times), and the temperature a pleasant 15 degrees. 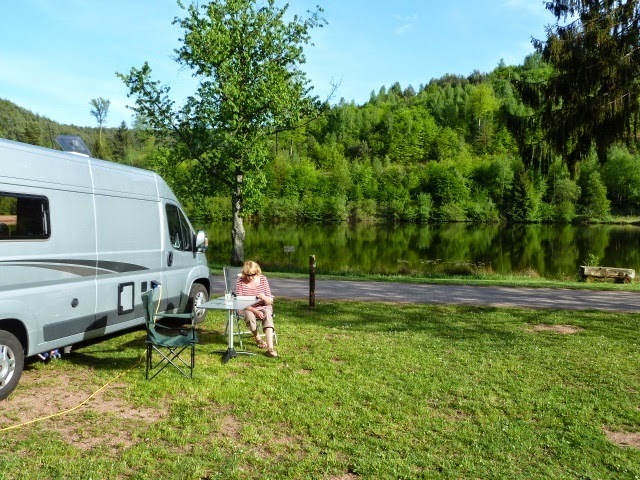 Arrived at the campsite in the outskirts of Luxembourg (Alzingen) at about 2.30pm to a friendly welcome and a spotlessly clean site. Also free WiFi so we can tune in to the BBC web election coverage - yes we actually will like this! Most campers appear to be Dutch but we have spoken to a few Brits, mostly en route to Italy. The couple in a motor home parked beside us were from York - small world. 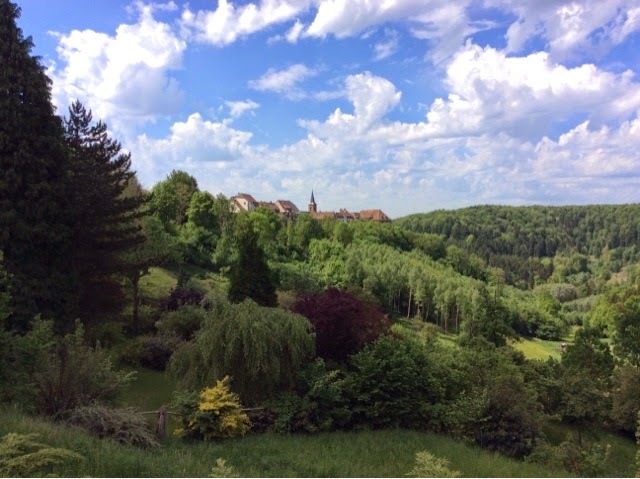 Once settled on to our pitch we walked to the local supermarket and, having never tasted Luxembougois wine, we purchased a local wine - a Pinot Gris. We intend to have an early night and look forward to a tour of Luxembourg City tomorrow. Waiting for a drink on arrival- honestly the service can be so slow! Carol spent time in the early hours peeking at the BBC election coverage on the iPad. Don't know why cos it didn't change the result. Let's just say one of us is happy in this van. 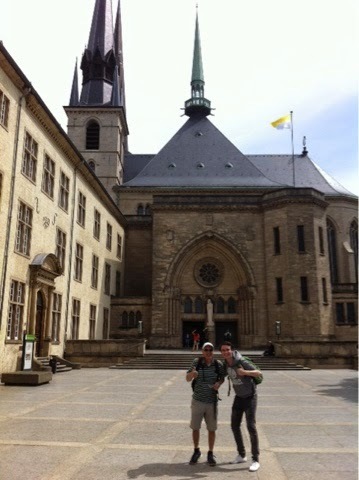 Today we cycled in to Luxembourg City for a day sightseeing. 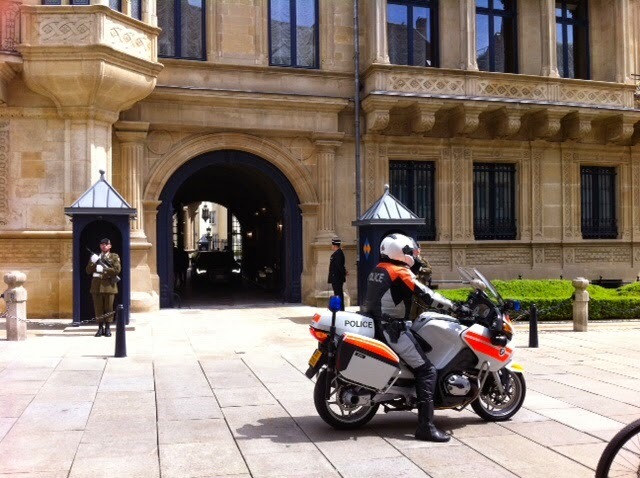 Whilst making our way in to the centre we passed the Palace of the Grand Duke. There were a couple of soldiers guarding the entrance with machine guns and also a couple of leather clad policemen with motorbikes. As Carol attempted to take photos - soldiers first and then hoped to take a picture of the rather gorgeous policemen (designer looking leathers, matching designer stubble,dark glasses, sultry looks -C ) - the policemen shot on to their bikes applying their helmets as the gates were opened and 2 black limos with tinted windows swept past with presumably some dignitaries/ royal persons inside. The guards then shut their boxes and disappeared inside. Unfortunately we had forgotten the camera so pictures were hastily taken by phone of which Carol's technique leaves a lot to be desired! Whilst browsing a postcard rack nearby we were interested to see various postcards of the Grand Duke , his wife and various family members could be purchased. There were postcards with the royal family in many different poses and dress styles and costumes( uniforms). I wonder if our Royal Family ever thought of this money spinning idea?! to help add to the coffers. We took a peek in to the Cathedral of Notre Dame and here's a photo of Graham being photo bombed as Carol took another phone photo! 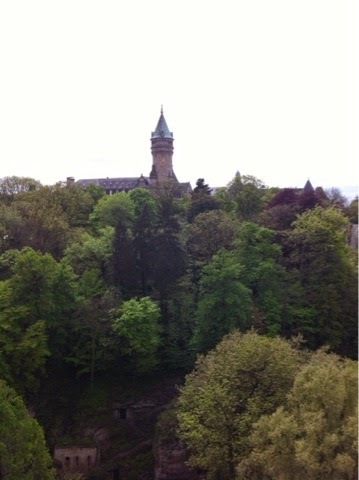 We had lunch in the park just below the city walls - a picnic much to Graham's delight. ( Wonder how long it will be before a proper restaurant lunch...... C ). Then walked through the centre and around some of the city wall. Unfortunately there was quite a bit of construction/ reconstruction being carried out so we didn't see the place at it's best.Interestingly one of the most strikingly opulent looking building was the Bank of Luxembourg - as picture taken from a distance below. There appeared to be a street market/fair in the main square - not sure if it was a permanent arrangement or seasonal. By the look of the food on sale it would appear that the favourite food of the people of Luxembourg was differing types of sausages ending with brurst. Although we saw 1 stall cooking/smoking whole sides of salmon which looked tasty- only saw this after the picnic unfortunately! Luxembourg City appeared a clean and very affluent looking place, judging from the Porsches and Maseratis we saw, with an amazing amount of beaurocratic/ administrative buildings for such a small place! Graham left muttering about the amount or not- of work which may take place in such splendid surroundings! 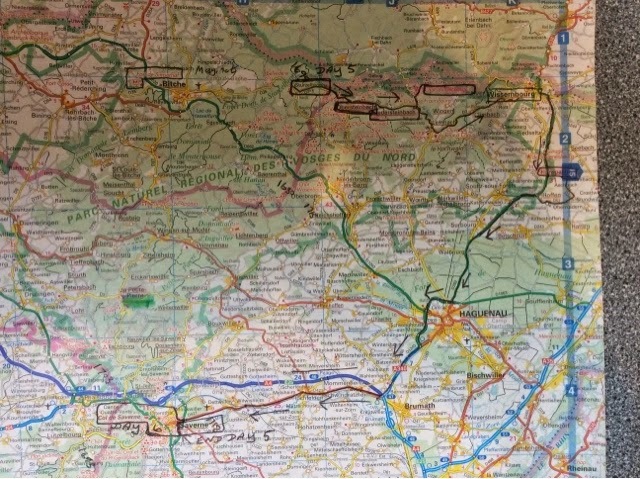 Tomorrow we venture in to Lorraine, France- possibly driving through Germany en route. For any camping visitors to the blog we will continue to rate the campsites visited - just in case they wish to follow in our footsteps! Bon Accueil, Alzingem - 8/10. Great location, good sized pitches, clean and friendly. The showers were a bit brutal - either scalding hot or freezing cold dependent on your luck! Nice and clean though and separate from the toilet area which makes a nice change. We managed to get on the road before 11am including a Supermarket shop! - a fantastic achievement for us. 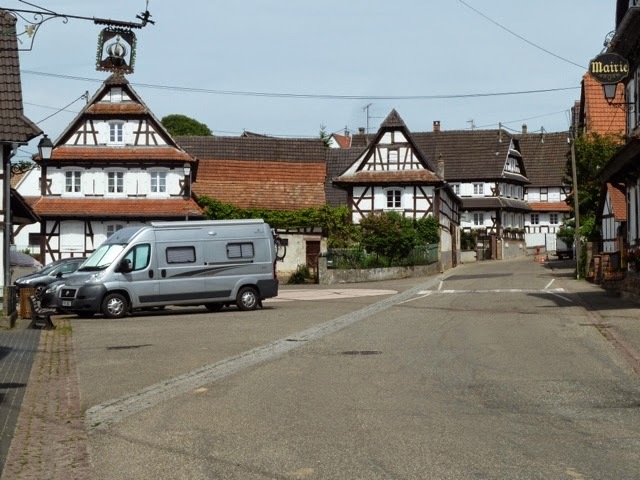 Took the autoroute through Germany and back in to France - Lorraine. 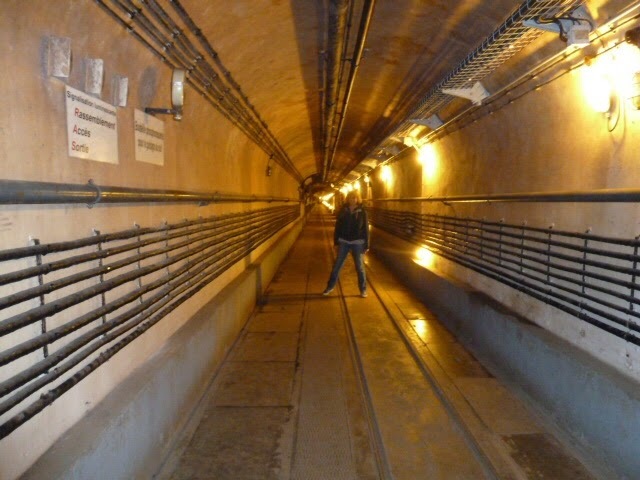 Graham wished to visit a fort on the Maginot Line en route so we decided on the Gros Ouvrage du Simserhof just west of a town called Bitche - pronounced as it sounds! We arrived at 1pm - had lunch Chez Rex and then headed for the entrance to the attraction. Had to wait til 2.30pm for an English tour - there followed a short film, a ride through the ammunition rail route of the immense fort followed by a walking guided tour of the barracks. Left at 5.30 pm - a very comprehensive and informative visit - even Carol was interested most of the time! 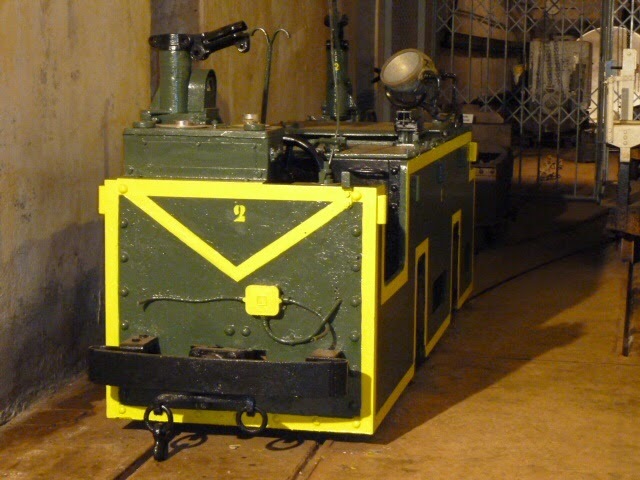 For those of you that are not aware of the Maginot Line - it was a series of forts and linked tunnels deep in the ground along the East of France right from the north to Nice. It cost millions of francs to build with the hope of preventing a repeat of the WWI invasion from you-know-who. The forts were self sufficient and the troops could live for 3 months without need for any contact from outside. As it was in this particular fort the troops were there for 10 months until ordered to surrender without any loss of life. The Germans invaded Belgium quicker than anticipated instead of France and entered through the back door so to speak! The poor troops who had spent months below ground ready to fight for their country were rounded up and sent to prisoner of war camps in Germany. A few troops were kept on to show the Germans how to maintain it. When the Germans left they tried to blow the place up to no avail although it was said to have been rigged up for the French to do just that if able prior to invasion - our guide says it may have been a final defiant act of sabotage on behalf of the french, after all, it did cost €80m. 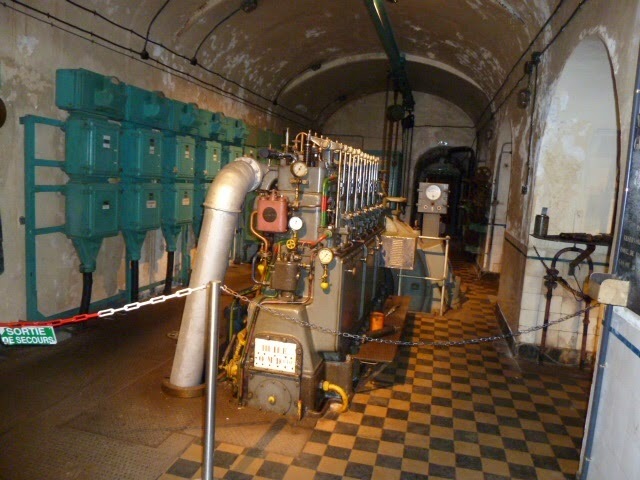 The French army kept the fort until 2010 but ceased maintaining it after the mid 1960's - previous to that it served some function for NATO in the Cold War. The building was sold to the local people in 2010 for 1€ - and is now run by the community as a museum, and a bloody good one it is too. 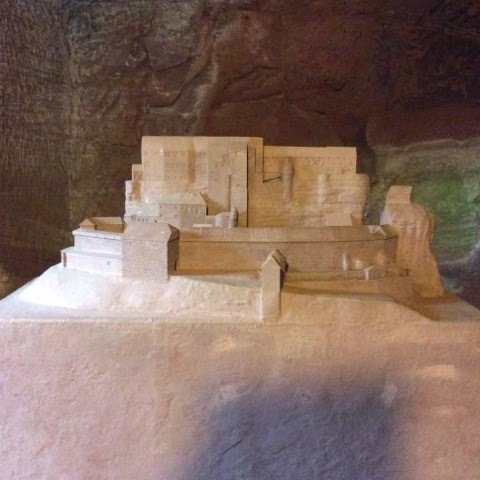 It's in fantastic condition and the architecture is amazing. The 80-odd year old tunnels go on for miles. They had every need catered for including a hospital, dental studio and mortuary. The officers lived in considerably more comfort than the rest of the troops even having their own kitchen and dining areas and their own sit down toilets, whilst the troops managed with hole in the ground squat toilets shared between many more soldiers - apologies for these sanitary details but Carol was most interested - must be the nursing background! They had enough supplies to endure 3 months without outside contact but only 2 weeks supply of wine! Fortunately the supply chain for wine continued without interruption until their surrender. Gunners on duty were 2km away from lunch served in the cuisine! So the gunners were served their meals at their posts - guess they were real warm! Spot the cables! 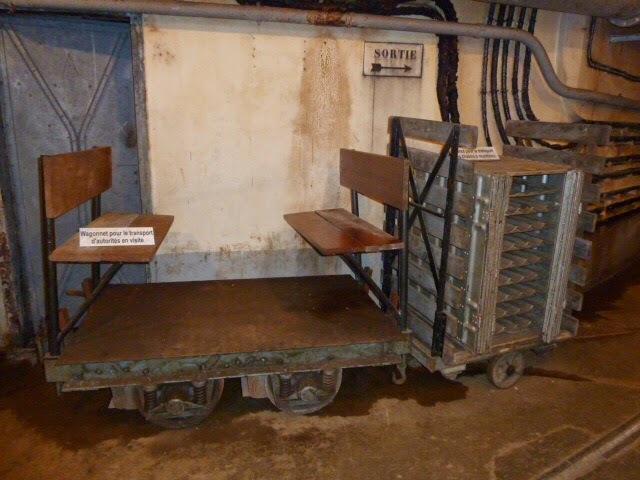 Soldiers walked, ammunition goes by train - this pulls 350 tonnes. Officers also go by train. Note the wine rack at the back. Must get one of those in my Mercedes! 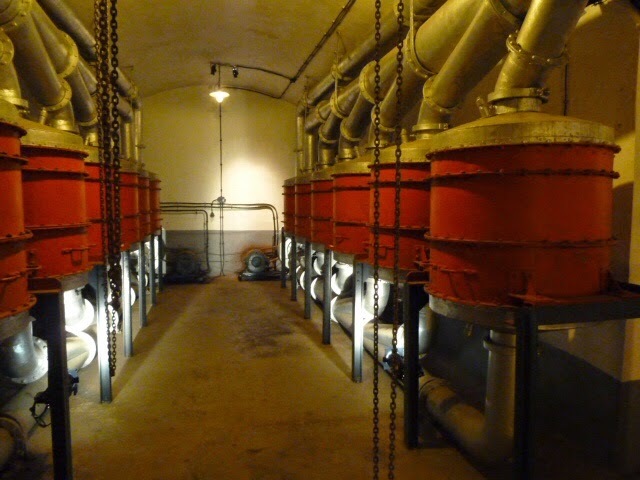 All air in the tunnels was filtered before it came in, to avoid gas attacks, and the air pressure in the fort and all tunnels was higher than outside. These are the filters. There are 4 sets of these. They still work and the noise from just one was deafening. The vist lasted just over an hour, it was damp and cold and we were glad to see the sun at the end. Imagine being there for 10 months! 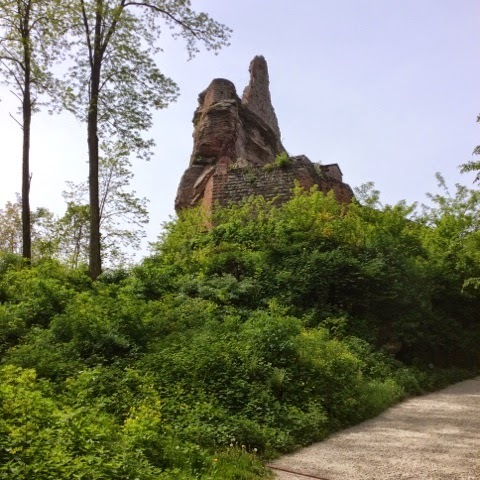 Our guide was a young German - looked to be in his 20's - we wondered how he felt talking about the German invasion - he said he had taken some British WW2 veterans on a tour recently and he felt humbled. Another young female guide said she was so fed up of French visitors complimenting her on her French accent as they thought she was German ( she spoke in a local accent) that she says she comes from Bitcher Land! After a rather lengthy search for a garage for diesel in Bitche we made our way to our campsite for a couple of nights in Sturzelbronn 12 kms from Bitche. A tranquil site overlooking a small lake in a forested area. There are many static caravans with varying types of add on gazebos etc and a handful of touring pitches. Our pitch is right on the edge of the lake. We are the only Brits on site - amongst the French and Germans and the cause of much curiosity given the looks from the strolling people passing by! The view from from Rex and the outdoor swimming pool, with diving platform. Today we had a bit of a nothing day as Graham would say. We were listening to a German radio last night which had a song playing "give me the sun and I will waste my time" how right! Had breakfast outside overlooking the lake. Whiled away a few hours reading and sunbathing. Lunch also Al fresco . Walked for a couple of hours along the forest trails failing miserably to find a route provided by the campsite. And back for pre dinner drinks and dinner chez Rex. Tomorrow we hope to do more travelling and sightseeing but unsure as yet where we will end up for the night. The weather forecast shows 4 more days of good weather before rain and lower temperatures are predicted. We guess we will then head for the larger towns/cities to utilise their indoor attractions! 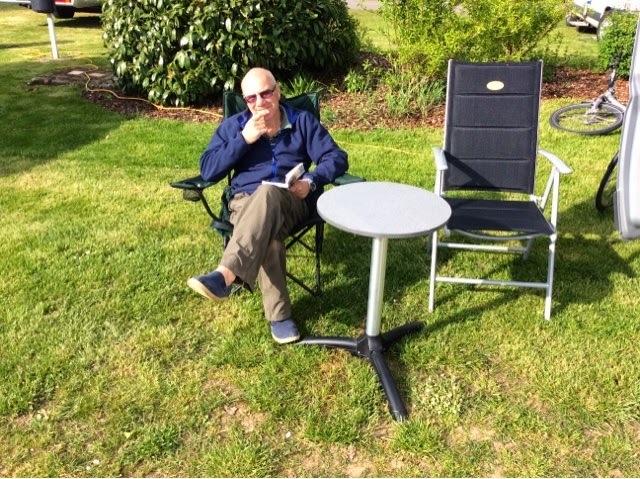 As the campsite emptied after the weekend visitors we were left rather isolated - nice and peaceful though! 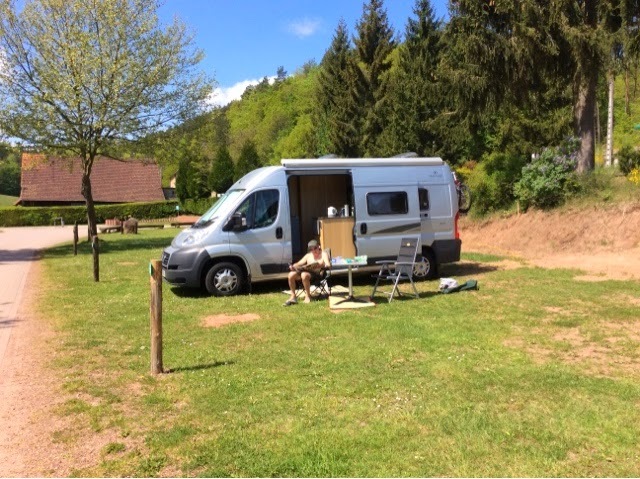 Score for Camping du Muhlenbach 9/10. Fantastic views of the tranquil lake. Friendly staff. In season a bar. A shop with basic items but limited opening hours. In season this could be a 10/10. May 11th. Day 5. 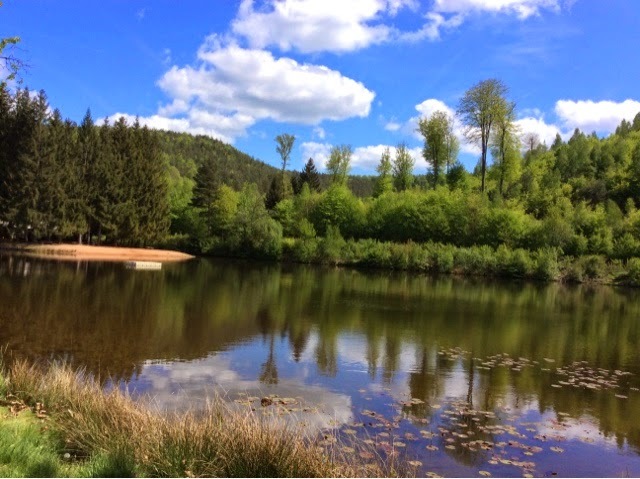 Sturzelbronn to Saverne. 73 miles. Our route today. Sightseeing tour day. On the road by 10.30 am - what is the matter with us! - perhaps being near the German border has made us more efficient! 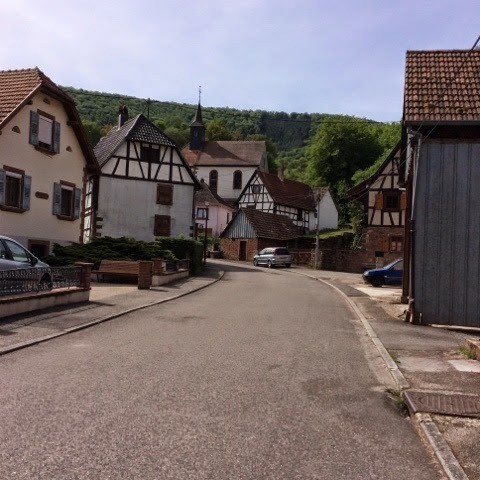 We drove on through some very pretty villages - Obersteinbach and Niedersteinbach. In Neidersteinbach Graham had a good long conversation with an elderly male resident jardinier who passed by with his wheelbarrow and put the world to rights! 300 citizens when he was born lived in Niedersteinbach and now only 100, all the young ones have left, and it looked like he didn't have long either. The butcher and baker shut down, I doubt he drives so he eats what he grows and gets the rest from the travelling vans. The church and some houses at Neidersteinbach. 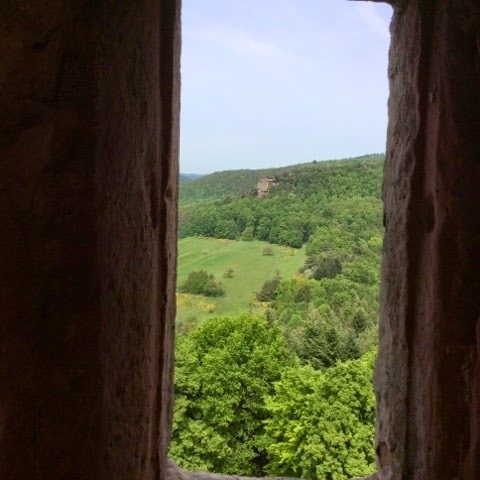 We continued on to Chateau de Fleckenstein. Now in ruins it was built originally in the 12th century and added on to in the 16th C. It was destroyed in 1680. When the last baron died in 1720 it became the property of the Prince of Rohan. Taken back in the French Revolution it now belongs to the community. It has been preserved - now having shop, visitor centre etc. Mostly it is visited for the great views of the forested area which surrounds it. After a hasty lunch chez Rex we continued on to Wissembourg on the border with Germany - French side. A quaint town with ramparts. A little reminiscent of Bruges - with small canals overlooked by ye olde worlde timber framed houses. 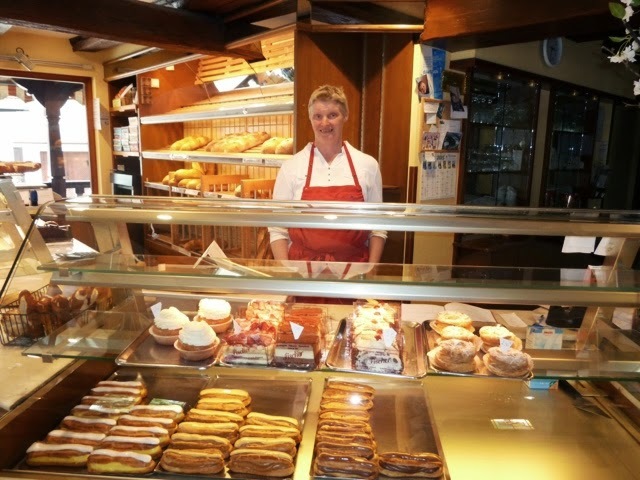 The owner of our last camp site had promised us the best patisserie in France! No really, there is a national concours to find the best pastry maker each year who can wear the blue, white and red collar, and this year it was Patisserie Rebert in Wissembourg - what luck! We checked at the Tourist Office where we could find such delights - it was fermé! Yes we had endured rather stale bread cheese butties to put us on for no avail! 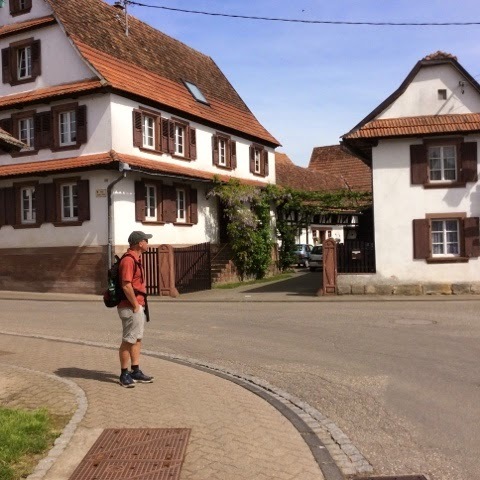 In fact most of Wissembourg was closed like a ghost town. So dear reader remember do not visit Wissembourg for a bun on a Monday as you will be sure to be disappointed! But the town itself is lovely.
. We left with a cheery Au Revoir but did not look back to see the reaction to the visit from Les Anglais! We did a quick supermarket shop on the outskirts of Haguenot - wine, beer , gin - all the essentials! When perusing the ready meal section Carol's eye was drawn to a beef in sauce regional dish - looking on the ingredient list was amazed to see viande de cheval (horse meat) contributed to 35% of the content! Well at least it was labeled was Graham's response. Needless to say we left it on the shelf. On to Saverne. We arrived at our campsite - chose our pitch and headed for the small swimming pool. The maintenance man was just closing up but kindly re-opened to allow us a brief dip after a tiring and sticky day. What a hero! 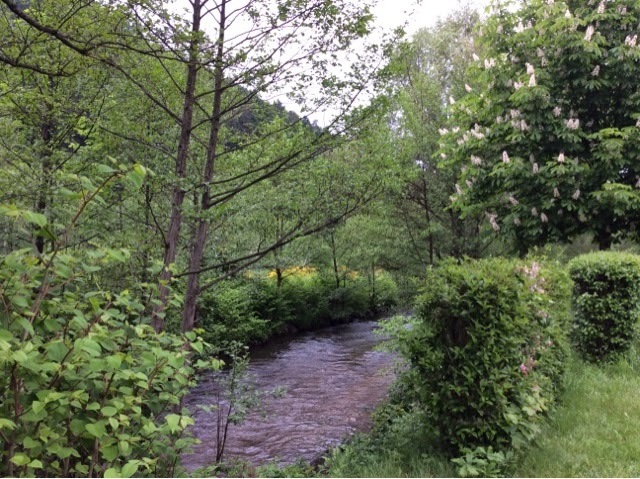 Cycled to Saverne and on to the Jardin Botanique du col de Saverne. 2.5kms up hill with no flat bits was a little hairy with cars and lorries whizzing by on hairpin bends and a sharp gradient to 335m , 1,099ft. A good work out for Graham and thank God for the electric bike says Carol. 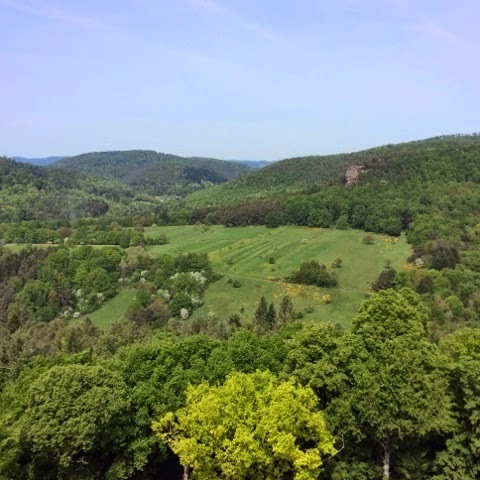 The garden had views across the foothills of the Vosges and apparently the Black Forest on a clear day - can't say it was obvious to us and it is a clear sunny day. There were various rare orchids scattered through the gardens but of the small wild looking type. Think you needed to be well into orchids and gardens to get the best out of a visit here but very picturesque all the same. Unfortunately it was situated between one of the hairpin bends and so it was not as tranquil as we had anticipated - and not the ideal spot for a - yes - quiet picnic! The cycle back downhill took no time! 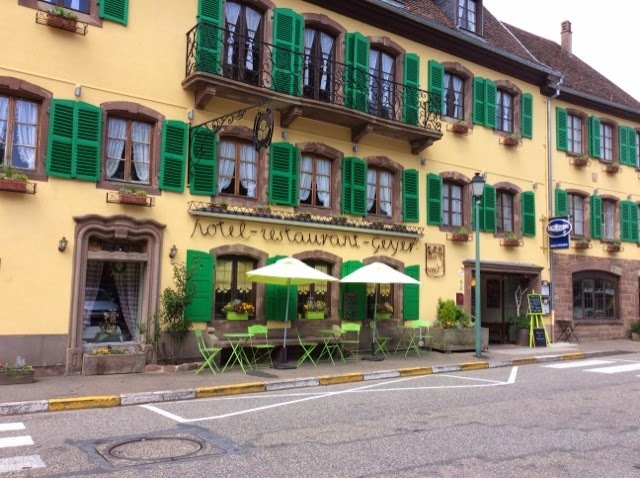 - and we left our bikes in the centre of Saverne to explore the town. 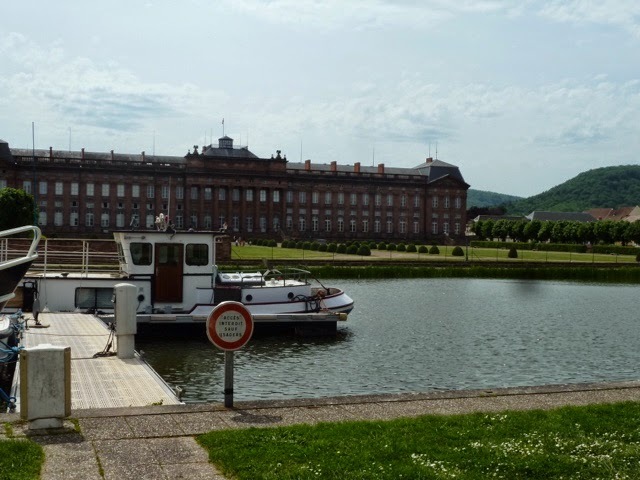 Saverne is a small town dominated by the Chateau Du Rohan situated right in the centre. An imposing palace like building it is now used as a Primary school and youth centre amongst other things. It was originally built for a Pope - destroyed by fire and renovated by Napolean. We saw children playing happily on the lawns near to sculptured shrubs - viva la Revolution! The Chateau overlooks a Marina where boats can be hired to cruise the canals. We enjoyed a stroll around the town and the marina fortified by a rather delicious ice cream. After a little shopping -sandals for Graham (he'd forgotten to pack some) and a visit to a Traiteur to buy Crevettes salad, something that looked like potato rosti and a slice of salmon en croute to enjoy tonight for dinner with salad, - hopefully Al fresco as it is still very hot - feels like 28 degrees C.
We are enjoying the sun while we can. Back for a quick dip in the pool to cool off and aim to spend the rest of the day chilling out doing nothing much at all! Score for Seasonova Les Portes d'Alsace. 9/10. A generous score mostly based on the enjoyment of the small but lovely swimming pool. The shower block was communal so you walked by the urinals to the showers! - not sure this was because it was out of season as another door to what looked to be similar facilities next door was locked. At least the washing up area was separate! 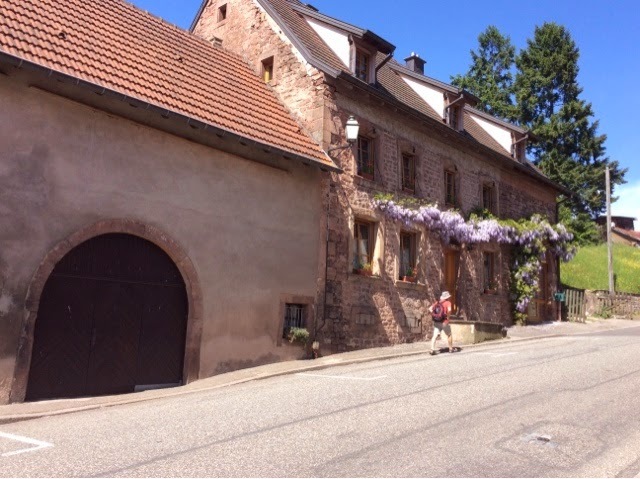 It was situated a bit of a hike up a hill from the centre of Saverne - so although described as walking distance away it felt too far to attempt a visit to a restaurant as we anticipted the walk back would be daunting - what a shame ( -G). May 13th. Day 7. 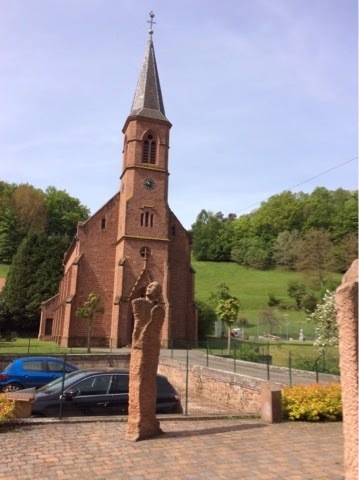 Saverne to Celles- sur- Plaine ( via la- Petite-Pierre). 72 miles. We took a short walk to see the Maison des Paiens - a Renaissance house built in 1530 on the site of a Roman Watchtower. Apparently there is a walk to the Chateau of La Petite Pierre but excuse us but we've got Chateau weariness so here's a photo of it from a distance! We thought it was a pretty village but more touristy, looking to be geared up for summer tour groups if the local hotels were anything to go by. We took our leave and headed back on the road. Back to the N4 and onwards to Celles sur Plaine. We picked a pitch overlooking the river and put our awning up for the first time to shield us from the glorious sunshine. View from Rex on our river side pitch. An hour later and Carol is writing today's ramblings under the awning whilst thunder strikes and pouring rain hits the top of the awning! Well at least you can sit outside in the rain with an awning! After dinner we glanced through the pouring rain over to Kenny and Sheila's rather smaller VW van and could imagine how cramped it would be sheltering in there with their black Labrador. So we invited them over to us and put the world to rights over a few glasses of wine. Tomorrow Kennie is cycling another 100 km or so and Sheila will meet him for lunch once he has satisfied his competitive cycling fix. Tomorrow we aim to cycle to and around some of the lake at a more leisurely pace - weather permitting. Hope the great weather will last the whole time for you. Great post. Am liking your blog. The van looks great, I must get one! I don't know why everyone is leaving Neidersteinbach, it looks very quaint and nice, those young people don't know what they're missing (a job perhaps?) 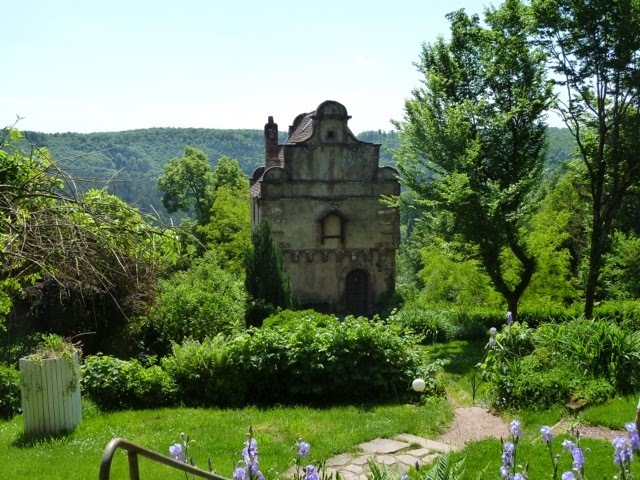 Regarding Chateau de Fleckenstein, isn't the Prince of Rohan from Lord of the Rings? All the villages look very quaint and clean and the weather sounds good, despite the recent rain. It's freezing over here at the moment, cold wind from the North....brr.